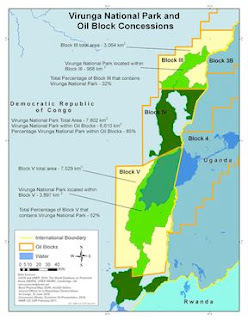 March 2011: A British company has been forced to suspend oil exploration plans in the mountain gorilla haven of Virunga National Park in the Democratic Republic of Congo after the Congolese government condemned the firm's environmental impact assessment as premature and superficial. 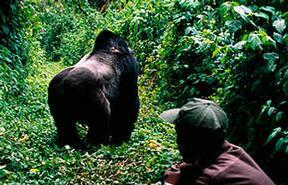 Virunga is home to 200 mountain gorillas, as well as a small population of eastern lowland gorillas. In an open letter to the worldwide conservation community, DPR's environment minister clarified his government's position on the published intentions of SOCO International at the World Heritage Site. In his letter, the minister states that his department has taken ‘specific steps, which have led to the suspension of the given oil exploration activities. The Minister has also confirmed that the senior management for Soco Oil had assured him that they ‘will not attempt any prospection work in the park unless a positive consensus is achieved in their favour'. WWF has welcomed the minister's announcement. ‘The Environment Ministry did the right thing, and what we hope to see next is a firm declaration guaranteeing there would be no exploration in this iconic and fragile park now or in the future,' said Natalia Reiter, a spokesperson for WWF International. 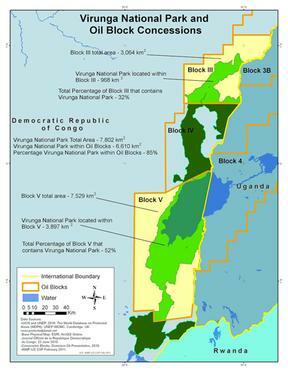 although Congolese law prevents oil exploration within the park itself . Virunga National Park is Africa's oldest national park and home to 200 of the world's mountain gorillas and a small population of eastern lowland gorillas. Covering 7,800 square kilometers, the park contains more species of mammals, reptiles and birds than any other protected area in Africa, and possibly in the world, and has an exceptional diversity of landscapes stretching from the glaciers of the Ruwenzori Mountains, at more than 17,000 ft, to impenetrable forests, savannas, rivers, Rwindi and Semiliki, and lake ecosystems. Bloc V is an oil exploration concession assigned by contract to a consortium of three companies, Soco E&P (implementing partner), Dominion Petroleum and Cohydro. More than half pof the concession falls within Virunga National Park, although Congolese law prohibits oil exploration activities within the national park. WSLS's made a huge mistake!!!!!!! Have you ever heard of the Bili Ape?